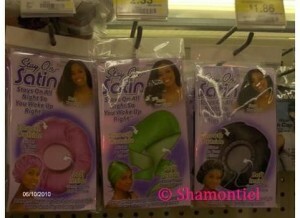 » News and Advice » Hints and Tips » Afro Hair, Why are Satin/Silk Wraps Necessary for Sleeping? Cotton pillowcases cause friction on hair and may lead to excess hair coming out, especially with wild sleepers. Oil from the scalp also sets into cotton pillowcases, which can lead to dry hair. If you’re skeptical of this, put oil on your hair and see how many stains the cotton pillowcase will have by the time you wake up. It defeats the purpose of oiling your hair if your pillowcase gets more hair oil than your scalp. Silk pillowcases and silk hair wraps (also called “wrap caps” or “head wraps”) help keep moisture in the hair, and for dry hair, which can be common with black hair, this is especially important. For women with perms or pressed hair, wearing a satin or silk head wrap can also help flatten hair and keep a hairstyle neater for a longer amount of time. If the hair is wrapped around the scalp, this also helps avoid bushy edges and ends. Wearing a wrap cap is also necessary for styling purposes. If you have really thick hair, especially after it’s been blow dried, hair wraps are an effective way to flatten the hair volume down. Make sure to use a wide-toothed comb and a wrapping brush (both pictured on the right) so the hair wraps evenly around your head. Wrapping hair lotion helps mold hair into place. Some wrap caps claim to have ingredients in them that lead to hair growth. While it may be hard to believe the hair wrap can make hair grow, the material satin or silk is soft enough to help keep healthy hair moisturised and not pull out as much. Those two perks alone can help hair grow regardless of how many times the wrap cap may be washed. Hair wraps range from £2.00, maybe a couple more pounds if it contains ingredients to help hair grow. Hair wraps are available at TZ Retail Shop. While the tips of the packaged hair wraps are convenient for wrapping around your head for a tighter fit, visiting a fabric store and buying a strip of silk or satin fabric will work just as well. Make sure each piece is long enough to twirl towards the top of the head and back around or lengthy enough to tie the ends into a knot so the hair wrap will remain in place.